Show your valentine how much you care by presenting them with this gorgeous red and pink arrangement. Red roses, pink Asiatic lilies, pink alstroemeria, miniature red carnations, pink waxflower and lush pittosporum create a full, multidimensional display. 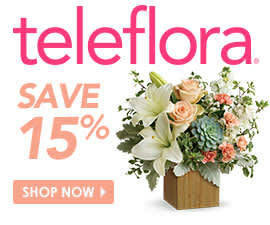 Delivered in Teleflora’s pretty pink bunch vase, this bouquet will bring you even closer to your special someone. Celebrate your love with a gorgeous floral arrangement delivered right to your home. Our Happy Harmony Bouquet provides a harmonious mix of red roses, red alstroemeria, red carnations, white cushion spray chrysanthemums, pitta negra, seeded eucalyptus and lemon leaf. The bouquet arrives in Teleflora’s Happy Harmony Cube, a beautiful handmade vase that is adorned with red and silver hearts – perfect for Valentine’s Day. Not all valentines are romantic partners. You can surprise your sibling, parents, grandparents or close friend with the dainty Hugs and Kisses arrangement to show how much you appreciate them. With white daisy spray chrysanthemums, pink carnations, red miniature carnations and red roses, this beautiful bouquet shows off all the major colors associated with the day of love. It also arrives in a stylish red vase, which is accented with a sweet red bow. For an arrangement that is bursting with color and style, consider getting the Full of Love Bouquet. Comprised of pink roses, tulips, carnations and waxflower, this full mix of blooms make for the perfect accent piece on any table or countertop. The shades of pink are accented with fresh pitta negra and variegated pittosporum for added texture and greenery. We deliver this bouquet in a classic glass vase, which you can reuse for years to come. Remind your special someone how much you care by presenting them with the most quintessential Valentine’s Day blooms – long-stemmed red roses. The Always on My Mind arrangement comes with two dozen of the finest red roses, arranged neatly with salal and pitta negra. Also, consider this: If the typical dozen is an effective way to show your affection, imagine the reaction you’ll get when presenting your partner with two dozen blooms. Express your admiration in an extravagant way. With a stunning mix of hot pink roses, lavender roses, light pink roses, pink roses, light pink spray roses and lavender spray roses, this incredible arrangement is guaranteed to dazzle its recipient. An assortment of greenery accent the delicate hues, allowing the colors to pop.